With Lance Armstrong's historic 7th consecutive victory at the Tour de France, it seems more and more Americans are dusting off bikes, pumping up tires, and heading out to enjoy some two-wheeled recreation. According to Outdoor Industry Foundation's most recent study: Outdoor Recreation Participation in the United States, 79 million Americans (age 16 and older) got on a bike in 2004, making it continue to be one of the most popular of the 22 human powered outdoor activities in the United States. During 2004, paved road bicycling Participants averaged 33 outings -- yielding a total of 2.6 billion outings among all Participants. Those who only got on a bike one time represented only 7% of all participants. The balanced profile of paved road bicyclists through the years reflects favorably on the widespread popularity of the activity. 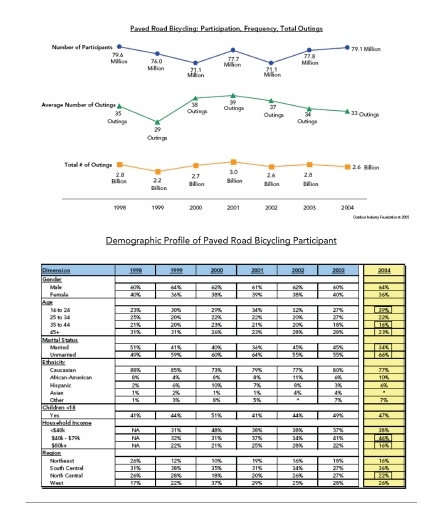 The 2004 paved road bicycling population is relatively gender balanced -- males (57%) and females (43%) -- but the representation of females within the population is lower than in 1998. 2004 Participants are very balanced across all age segments. For the second consecutive year, the majority of Participants report the presence of children under the age of 18 in their household and incidence is greater than levels in 2001. Data for this trend report were collected as part an on-going study of Americans' leisure time behavior and attitudes. For comparative purposes, the quarterly data collected for this report have been aggregated on an annual basis for each of the years shown 1998-2004. Each quarter, telephone interviews are conducted using scientific sampling and random digit dial methodology. A disproportionate stratified random sample by census region is used for the study. Calls are made at random until a representative quota for each region is reached, and a total of 1,000 interviews are conducted. Only Americans age 16 and older are interviewed. Interviewing for the study is spread over 14 consecutive days in each quarter. The overall 2004 Participant/Enthusiasts results are projected to the American population, age 16 and over, with a margin of error of +/- 1.6% at the 95% level of confidence. This is a constant because all of the Participant levels are calculated using the information provided by all 4,000 respondents. To view the complete Bike section of Outdoor Recreation Participation in the United States: 2004, click here. Outdoor Industry Foundation (OIF) is a non-profit foundation established by Outdoor Industry Association to encourage active outdoor recreation for all Americans. OIFs charter is to increase participation in outdoor recreation and to encourage and support healthier active lifestyles. Through education, partnerships, programs and advocacy, OIF is working to make active outdoor recreation the number one leisure activity in America. We invite you to join us on this important mission by making a long term commitment to the health of our industry, our public lands, and our nation. For more information go to www.outdoorindustry.org or call 303.444.3353.